Take a sip of this invigorating organic apple strawberry juice and savor the sweet taste of fresh-squeezed fruit. You’ll love its summery flavor any time of the year. Organic Apples and Organic Strawberries. Amount per Serving: Calories 165, Calories from Fat 0, Total Fat 0g (0% DV), Saturated Fat 0g (0% DV), Trans Fat 0g, Cholesterol 0mg (0% DV), Sodium 22mg (1% DV), Total Carbohydrate 39g (14% DV), Dietary Fiber 0g (0% DV), Sugars 33g (includes 0g of added sugars 0% DV), Protein 0g, Vitamin D 0mcg (0% DV), Vitamin C 12mg (13% DV), Calcium 0 mg (0% DV), Iron 0.5 mg (3% DV), Potassium 300 mg (6%). Daily Values (DV) are based on a 2,000 calorie diet. 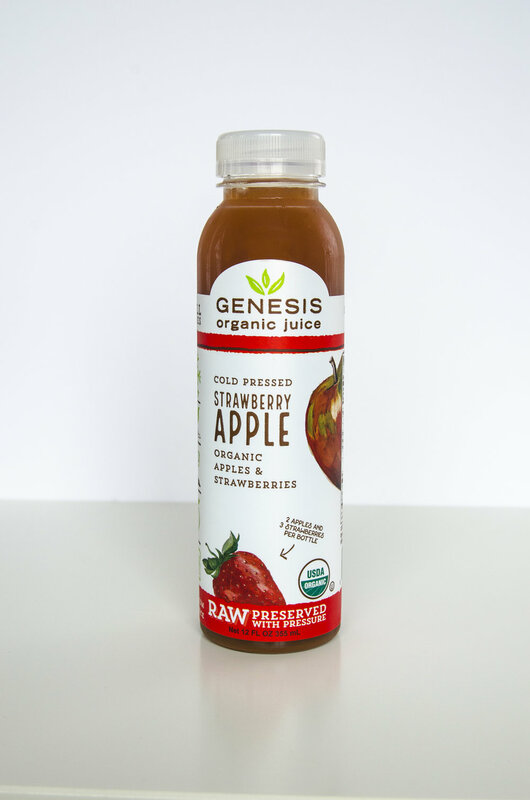 Fun fact: There are 2 1/2 strawberries in every bottle of Genesis Strawberry Apple! We work directly with Oregon strawberry farmers. Meet our newest strawberry farmer, located just 8 miles from us! Click here for more info.